Happy sunny Monday! Hope you had a wonderful weekend! 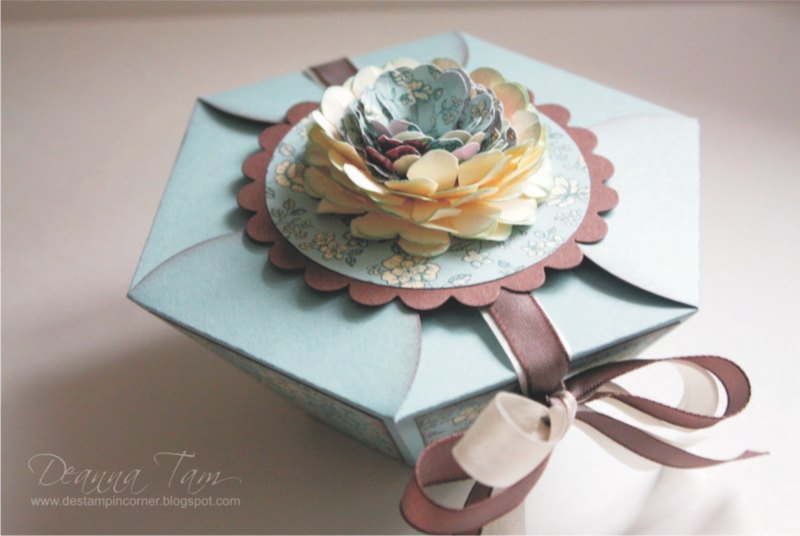 Here is a box made with the Petal Cone Die in Vellum paper. I flipped it upside down and decorated it. I stamped the leaves from the Growing Green stamp set in Garden Green ink on each panels of the box. The big flower was stamped 3 times on Vellum paper, cut them out, curled the petals and then assembled them with mini glue dots. I added a pearl in the middle of the flower which added some elegant to it. The flower at the top of the box was done the same way except I didn't curl the petals. What do you think of this box? I tried to put one flower hair clip in there and it holds fine without taping the flaps up. The hair clip was light enough to be able to hold the ribbon at the top without the flaps opening up at the bottom. I also tried something a little heavier ( ie. mini chocolates) to go in the box. I cut a piece of card stock to go inside at the bottom, close the 4 flaps and put mini glue dots on 2 flaps to hold it close. I was able to hold the box at the ribbon at the top. Such lovely little box! This box is gorgeous!!! I will be featuring this project on My Crafty Picks #29 with a link back to your blog on 8-14-11. 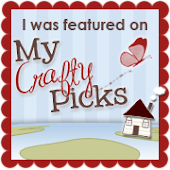 Make sure to stop by and pick up your blog badge for being featured!! Tthis is very pretty!!! I like it a lot. This box is just beautiful. Any one would love to receive it with goddies inside. Very pretty! What an awesome way to present a small gift! ou pourrais je trouver ce si joli patron ?